Scandone Avellino did the 'ultimo colpo' as the say in Italy and signed scoring guard DeMarcus Nelson(1.93-PG/SG) previously of the Chicago Bulls. The 2008-2009 season had lots of ups and downs for DeMarcus Nelson who shifted between the NBDL and the NBA on more than one occasions. 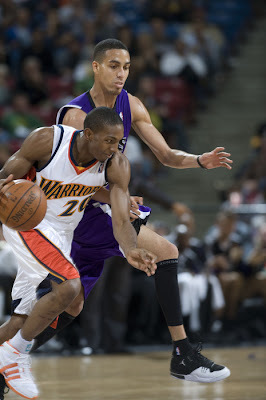 Initially he signed with the Golden State Warriors but in November of 2008 he was assigned to Bakersfield Jam in the NBDL. In December he was recalled back to Golden State after 9 games in the NBDL and was then after 13 games games he moved to Europe and KK Zagreb in January of 2009. That was also short lived as in after a single game he left again and in March he went back to Austin Toros in the D-League. In April he signed as a free agent with the Chicago Bulls who waived him in July. In 13 games with the Golden State Warriors he averaged 4.1 points 1.8 rebounds and 1 assists. Complication with Newble, Tsaldaris in? McCarty to play for Russia after all? Cedric Simmons to sign with Peristeri?